Every year, I consider giving up on lilies, we haven’t been able to get the lily beetles under control. And what was a carefree flower has become a disgusting headache. I can deal with the voles and chipmunks….but those bugs….. 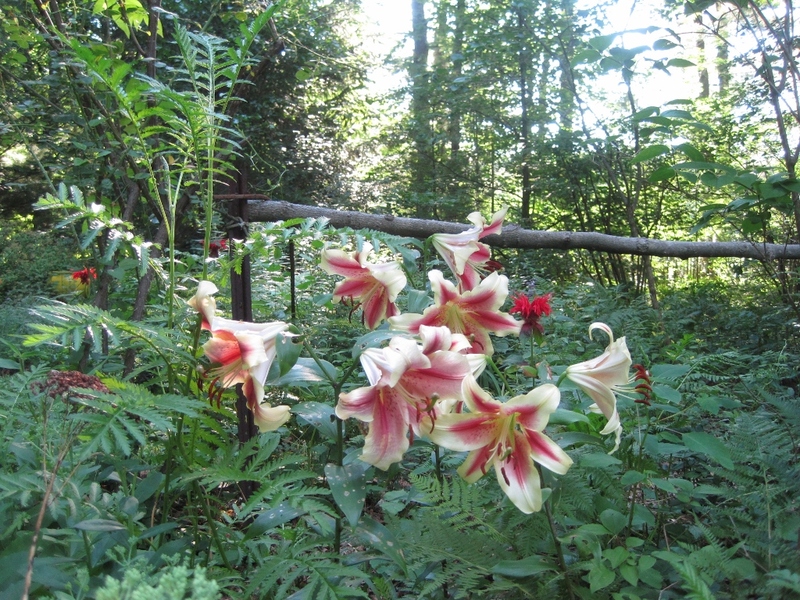 I just went out and sprayed the lilies that are being eaten with some Neem, we will see if it slows them down a bit. I’m reluctant to use pyrethrin in that garden since I think we may be getting a balance between the predators and the caterpillars and a heavier duty spray might knock that back out again. But, I may have to. The thing is though, that when we can have lilies, they are worth it. The colors, shapes, and scent can’t be beaten. They are the mainstay of a summer garden. I was reminded of this the other day when the few Orienpets that survived both winter, the voles, and the bugs opened. Leaving aside the lovely ivory and rose colors, the scent is incredible. The Orientals in a week will be even better. Nothing is better than late evening, the setting sun in the trees, and those lilies beneath the window. These guys didn’t make it this year, sadly. I think the voles got them. But I have a few by the library.